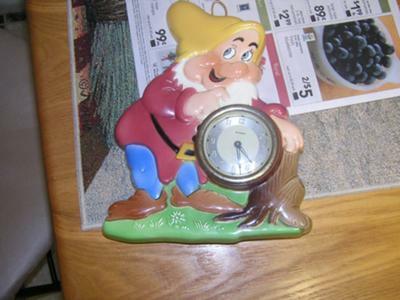 I know nothing about this clock, I just know it belonged to my father when he was younger. I am trying to find out if it is worth something or just a clock. I've been cleaning out closets, and getting rid of things, I would hate to get rid of it and later someday down the road, find out it was worth something, It is Very good condition, still ticks. On the face of the clock it says "blessing". and on the back of the clock is a stamp that says "Walt Disney Productions" with a copyright symbol and "Made in Germany" and some words in German which I guess may be the maker. I believe it says "ZENZIBAGER" and "J.A. SURAL HANAU/MAIN"